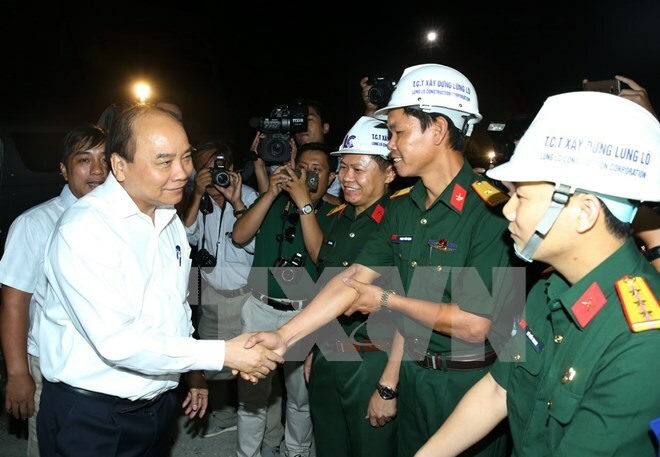 Phu Yen (VNA) – Prime Minister Nguyen Xuan Phuc visited engineers and workers at the construction site of Deo Ca (Ca Pass) Tunnel on August 27 on his way from Ninh Thuan to Khanh Hoa province. He applauded efforts by the engineers and workers who have weathered numerous difficulties to ensure the progress of this project, which is important to socio-economic development of the south central coast of Vietnam, especially Phu Yen and Khanh Hoa provinces. He said the construction marks a substantial capacity improvement of Vietnamese engineers and workers as they have shortened the progress by three months although building a mountain tunnel is a challenging work. Thanks to the fine-tuned design, the length of the main section was reduced by about 1km while 4 trillion VND (179.3 million USD) was saved in the construction cost. The saved money has been earmarked for building a tunnel through Cu Mong Pass linking Phu Yen with Binh Dinh province. The PM asked the investors, contractors, engineers and workers to continue efforts to put Ca Pass Tunnel into use soon. Work on the tunnel, a key project of Vietnam, began in September 2014. The facility includes two parallel tubes, each of which is 4,125 metres long and 9.8 metres in diameter. The tunneling completed on July 31, two months ahead of schedule.